Kale Sea Salt Chips - 3.5 Oz. Veggie Organic Original Chips - 4 Oz. Quinoa Cheddar Chips - 3.5 Oz. Organic Original Veggie Chips - 4 Oz. Hummus Sea Salt Chips - 5 Oz. Lentil Sea Salt Chips - 4 Oz. Quinoa Sea Salt Chips - 3.5 Oz. Quinoa Barbecue Chips - 3.5 Oz. Cheddar Quinoa Chips - 3.5 Oz. Kale Lemon and Olive Oil Chips - 3.5 Oz. Quinoa Sour Cream and Onion Chips - 3.5 Oz. Lentil Creamy Dill Chips - 4 Oz. Hummus Chips Roasted Red Pepper - 5 Oz. Lentil Chips Sea Salt - 4 Oz. Veggie Chips Organic Ranch - 4 Oz. Quinoa Chips Barbeque - 3.5 Oz. Quinoa Chips Sea Salt - 0.8 Oz. Hummus Chips Sea Salt - 1 Oz. Simply7 Giada Popcorn Sea Salt - 4.4 Oz. Simply7 Giada Popcorn Parmesan - 4.4 Oz. 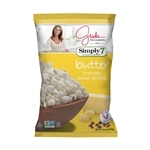 Simply7 Giada Popcorn Organic Butter - 4.4 Oz. Quinoa Curls Original - 3.5 Oz. Lentil Chips Creamy Dill - 4 Oz. Quinoa Chips Sea Salt - 3.5 Oz. Hummus Roasted Red Pepper Chips - 5 Oz. S7 Quinoa Barbeque Chips - 0.8 Oz. S7 Lentil Sea Salt Stand Alone Chips - 0.8 Oz. S7 Organic Stand Alone Veggie Chips - 1.25 Oz. S7 Kale Sea Salt Chips Stand Alone - 0.8 Oz. S7 Original Veggie Chips Stand Alone - 0.8 Oz. S7 Hummus Sea Salt Chips Stand Alone - 1 Oz. S7 Quinoa Sea Salt Chips Stand Alone - 0.8 Oz. S7 Quinoa Barbeque Chips Stand Alone - 1.25 Oz.